Agreed. But once they had the junk parked in front at the depot, whatta you gonna due when it won't make air or whatever? Believe that shuttle was the whole reason the Hoosier State originally developed on off days...it was figured that as long as they were running, might as well stick a passenger coach on the rear. Cardinal should be at least once daily, don't think there is any quibble about that. Three day a week trains are hopeless. IMHO The equipment shuttle to and from Indy should be run as a special extra train, without passengers on it. But, hey, that would probably take an Act of Congress. CSX would demand $10 million per train plus at least $75 billion in infrastructure to add sidings and improve the signaling? Today's (Sat) 51 was 19 min late to CIN, 2h26m to COI and 2h3m late to IND. Wonder if she got tangled up in Cincy? Not to worry, she won't be that late into Chicago. Rode last Saturday and we left Indy on time and hit every stop on time all the way to Dyer, where I got off and I don't think we ever got over 50. With way too much schedule padding, we dawdled our way to Chicago. If I had to guess the weather played a factor. Wicked winds with that storm front last night, lots of trees down and power outages. I saw it through Brownsburg today they had a conventional cab GE in the lead and a heritage unit of some sort, a few passenger cars, an genesis GE loco in the middle and more passenger cars? Must have been shuffling equipment from the Grove? He was 2 hours and 18 min late out of Dyer Indiana. 517 is one of the 20 GE 3200 horse road switchers built for Amtrak in 1991. They have been mostly relegated to yard duties lately, although one has been on the Crescent routinely, as well as two on the Coast Starlight. How often is the line hirailed between Ind <> Coi <> Cin? You'd think they'd send a truck down through around 3am to make sure the tracks are clear and everything was good to go... Also, what other freights and times besides P050/P051 use the line between those cities? Someone who knows for sure will have to chime in, but I think if passenger trains run on a line it has to be hirailed daily (or at least when the passenger trains run). 360/361 would run the line (if they don't go via Sidney). 360 would go thru in the evening, and 361 would probably be behind AMTRAK in the middle of the night. CSX would incur considerable additional expense calling a track inspector out in the middle of the night on OT. Then, if they do find something I think they need a second person to help clear anything so they aren't working alone. I don't know what AMTRAK pays to run their train, but I bet it would be eaten up pretty quickly calling out inspectors in the middle of the night on OT. I don't know all the details. There was a freight train having issues and took some time getting into McGonigle Siding. There isn't much pad at all until after Dyer. Track speed is 60, thus the reason for the "dawdling". FRA wants two inspections a week (week starting Sunday ending Saturday) with art least one calendar day between inspections for all classes of track if you are carrying passengers. If an inspector gets called to run track for a storm it is up to his judgement to call for additional help depending on what he sees and how big of a tree he feels comfortable cutting out of the way. If it's a whole tree across the track help will be most likely called in help if it's good sized, if just some limbs need trimmed then they will probably do it themselves. As far as the OT the inspectors get a ton of it, there is always something happening on the mainline, car on the track, semi on the track, cold runs, heat runs, flood runs, storm runs, mechanical problem with a train that requires track inspection, it's always something. 3 Likes trainmaster53, doublestacks and trafficcritic like this. Heads up to the north for a mid-day sighting of the Cardinal! 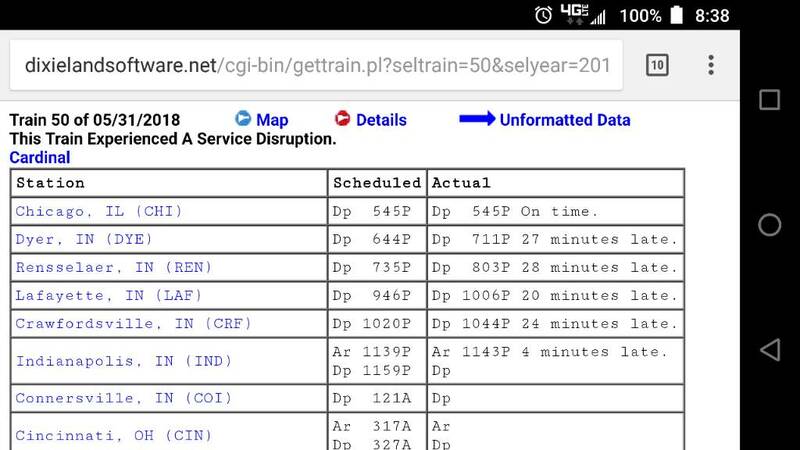 Amtrak 51 is nearly 4.5 hours late out of Indy; they lost 3:45 in New Jersey, no way to catch-up from that so early in the trip. They arrived in Indy at 9:34 AM Sat 2/11/2017 and departed at 10:08 AM. Just heard them get their EC-1 for the Crawfordsville Branch (but only to COR) at 10:15 AM. Lead unit is AMTK 195. The Northeast had that Major Snow Storm. Cant mess with Mother Nature. 12:36 Indy time, and it appears 51 is about to get going north again. They've been waiting for switching operations at CSX Lafayette yard. There were also caternary failures in and around NY Penn station, not necessarily weather related. All those new electric locomotives are worthless when there is no juice. One train got to sit 5 hours with no heat, toilet flush, or (gasp!!) Wi-Fi. Cardinal was lucky to have gotten out at all. I just saw a very late westbound Cardinal stopped on the B&O bridge over I-65 I-70 downtown. Anyone know the cause of 50's "service disruption" overnight? There's no way all 3 of these Amtrak trains (850, 851, and 51) are still out on the line this morning. Did the 8/31/2018 Hoosier State experience a service disruption (other than 850 being delayed an hour-and-a-half last night), or did their final arrival time on each end just fail to get reported or logged?